BIG BREAKING- Trail of devastation takes place in capital complex of Arunachal Pradesh on Friday morning. 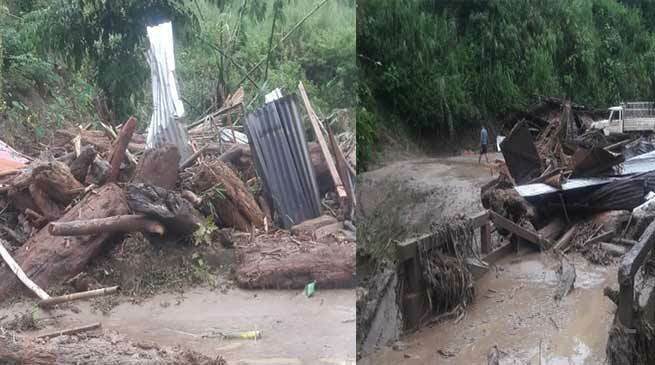 Four People and Several houses have been washed away. Trail of devastation takes place in capital complex of Arunachal Pradesh on Friday morning. Several houses have been washed away. It is suspected that more than four people have been washed away. However So far 1 body have been recovered from Papu nallah in Naharlagun. State disaster response force have been engaged for rescue operation. SP Capital M Harsha Vardhan, DDMO Moroni Sonam, capital MLA Techi Kaso are on spot and supervising rescue operation . Local people are also cooperating in the rescue operations. 11:00 am at least six vehicles have washed away from different location in Capital complex . 10:30 am land slide in Hoj-Potin road, traffic disrupted.